WHAT: The Variety Studio at Sundance Presented by Dockers is the annual Variety festival-filmmaker video series at the 2015 Sundance Film Festival in Park City, Utah. Between Saturday, January 24 and Tuesday, January 27, indie and award-winning actors and filmmakers will be interviewed by the Variety editorial team. Dockers will be providing Hollywood with some of their most popular styles like the Alpha Slim Fit Khaki and Signature Khaki along with some new collections to help complete a stylish, head to toe look. Dark Horse Wine raises a glass to bold filmmakers and original storytellers. As the official wine of the Variety Studio at Sundance, this exceptionally great-tasting, globally sourced wine will be served throughout the space. Talent will also have the opportunity to leave their own mark by branding leather goods, and will be invited to redeem a one-year supply of wine. 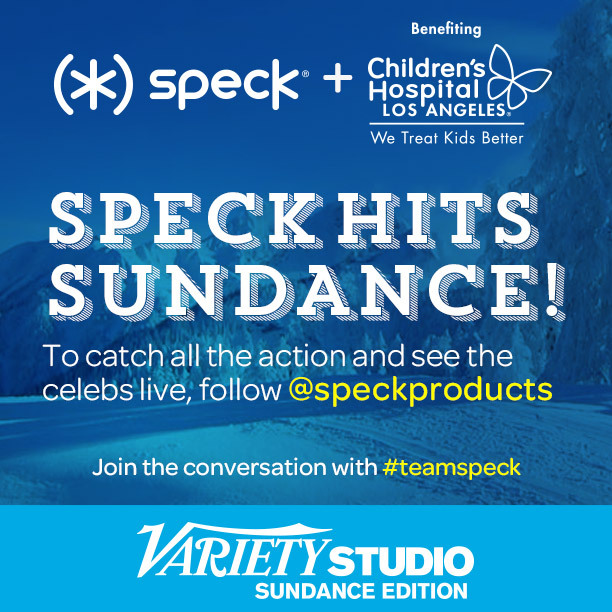 Speck, the leader in slim protective cases for mobile devices, will be partnering with Children’s Hospital Los Angeles to promote the signing of Speck cases by Sundance talent. The signed cases will later be auctioned off and 100% of the proceeds donated to the Children’s Hospital. Woolrich John Rich & Bros. will invite VIP guests stay to warm while in Park City via exclusive, luxury outerwear gifting in a variety of styles, including the signature Arctic Parka, Arctic Parka DF and Literary Walk Eskimo. TALENT: Alexander Skarsgård, Amy Ryan, Billy Crudup, Chanel Iman, Chris Pine, Cobie Smulders, Connie Britton, Constance Zimmer, Eli Roth, Ewan McGregor, Jack Black, Jack O’Connell, James Franco, Jason Isaacs, Jason Momoa, Jason Schwartzman, Jason Sudeikis, Jeffrey Tambor, Jennifer Connelly, Johnny Knoxville, Ken Jeong, Kevin Bacon, Kodi Smit-McPhee, Lena Dunham, Lily Tomlin, Mamie Gummer, Michael Angarano, Michael Fassbender, Molly Shannon, Noah Baumbach, Patrick Wilson, Robert Redford, Ron Livingston, Rosemarie DeWitt, Ryan Reynolds, Sam Rockwell, Saoirse Ronan, Sarah Silverman, Scott “Kid Cudi” Mescudi, Spike Lee, Toni Collette, Vincent Cassel, Winona Ryder, Zoe Kravitz, Danny McBride, Adam Scott, Alison Brie, Anders Holm, Brooklyn Decker, Chiwetel Ejiofor, Ezra Miller, Greta Gerwig, Jake Johnson, James Marsden, Jason Segel, Jemaine Clement, Julianne Nicholson, Kathryn Hahn, Kellan Lutz, Lena Headey, Leslie Bibb, Margot Robbie, Olivia Thirlby, Peter Sarsgaard, Richard Dreyfuss and many more. The Dockers® Brand has embodied the spirit of khaki for more than 25 years. Since their introduction in 1986, Dockers® has been perfecting khakis—and the essential goods to go with them—for men and women all over the world. No compromises in quality. Just versatile, essential style. Day to night. Monday to Sunday. For information on Dockers® and its products, please call 1-800-DOCKERS or visit www.Dockers.com. Dark Horse is an exceptionally great-tasting, globally sourced wine. Winemaker Beth Liston believes winemaking is a treasure hunt. She marshals the best agricultural and winemaking from around the world to deliver the unexpected: bold wine that out performs its price. Dark Horse is currently sold at select retailers nationwide for under $10 and is available in Cabernet Sauvignon, Chardonnay, Big Red Blend, Merlot. Follow us on Twitter @DarkHorseWine. About Woolrich John Rich & Bros. The Woolrich John Rich & Bros. collection reflects the Woolrich heritage by combining the brand’s historical identity with a contemporary interpretation of iconic Americana. The sophisticated take on military, outdoor and utilitarian style results in a collection of outerwear and sportswear that redefine American style with worldwide design influences. Woolrich John Rich & Bros is recognized for its contemporary and metropolitan take on quality―one that never strays far from the DNA and the values of the company it takes both its name and inspiration from: comfort, durability, resistance, warmth, simplicity and innovation. The Original Woolrich Artic Parka, introduced in 1972 for the workers of the Alaskan pipelines and now considered the quintessential down parka, is the worldwide recognized brand icon and symbol.